Travel to Russia has become easier than ever. However, visas are required. You need a fully licensed travel company like RNG to provide the necessary visa support and registration. Please click here for instructions and downloadable application forms. You are also welcome to call us at (646) 473-2233. All prices are generally quoted in rubles. Currency can be freely converted at banks, hotels or kiosks. Traveler’s checks are hard to cash. Credit cards are accepted in most places that work with foreign tourists. Some may turn down American Express. Visa and MasterCard are known, hence – more widely honored. ATM machines are available in major cities, but note: they do not have letters on the key pad, so if your PIN includes letters, do remember them as digits! Standard time zone for both Moscow & St. Petersburg: UTC/GMT + 4 hours (No daylight saving time in 2013). Remember to bring any medications you may need. Check with your health insurer before you depart to determine your coverage in the event of emergency. Many insurance providers offer specialized riders which can cover emergency evacuation. 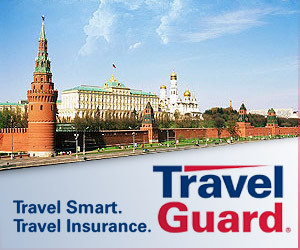 We do recommend buying travel insurance. Water quality varies widely in Russia. Your best bet is to drink and brush your teeth only with bottled water which is widely available in supermarkets. Be careful – avoid ice and raw foods and vegetables. Crime situation has considerably improved in Russia over the past couple of years. Moscow and St. Petersburg are a lot safer than many American cities. Precautions include not flaunting valuables, or walking alone at night through city outskirts or parks. In Russia, taxi fees are usually negotiated with the driver ahead of time. Do not use gypsy cabs or accept rides in cabs that already have a rider. We shall be glad to provide you with airport transfers by our company car. Tipping is increasingly expected at restaurants. Tip 10-15% depending on service. It is typical to round up the amount due to the next round figure.For more information please see our Frequently Asked Questions page.